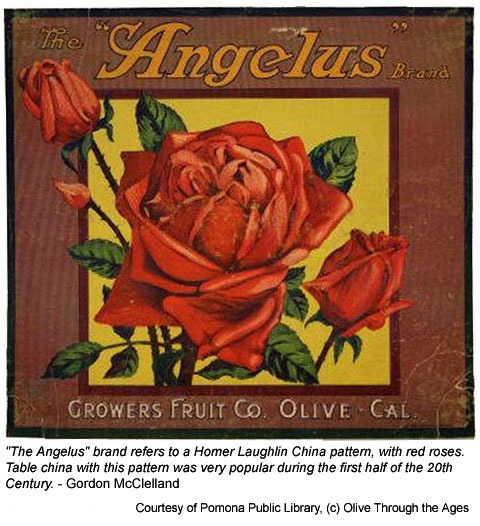 My thanks to Gordon for providing images of labels from his collection, shown in the section below, along with his comments about these labels, in italicized text. Click/tap the thumbnail images below to view larger images in a separate browser window or tab. 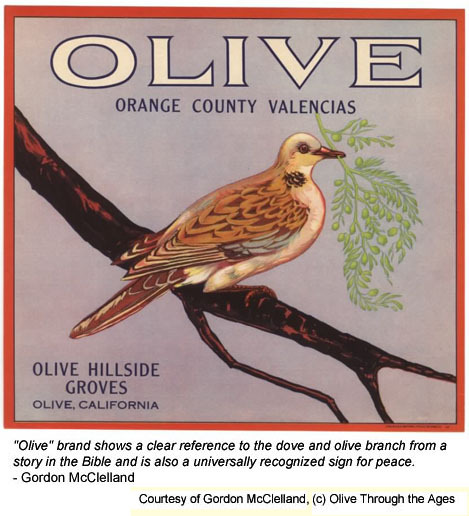 "Olive" brand shows a clear reference to the dove and olive branch from a story in the Bible and is also a universally recognized sign for peace. 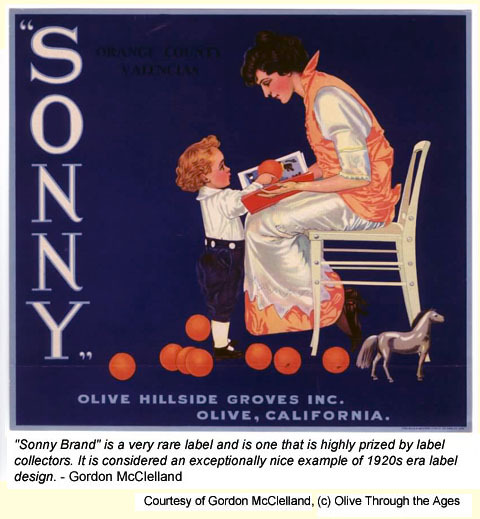 "Sonny Brand" is a very rare label and is one that is highly prized by label collectors. It is considered an exceptionally nice example of 1920s era label design. 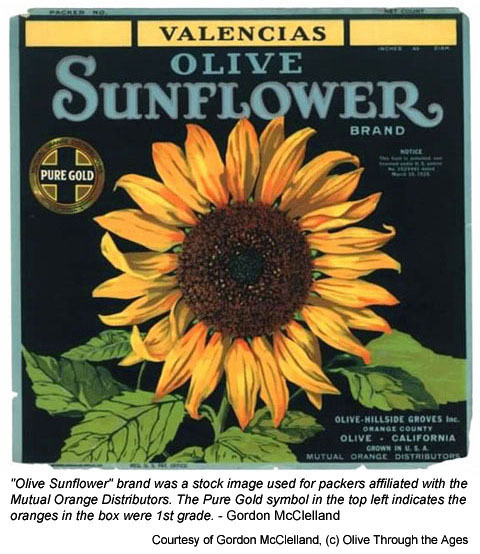 "Olive Sunflower" brand was a stock image used for packers affiliated with the Mutual Orange Distributors. The Pure Gold symbol in the top left indicates the oranges in the box were 1st grade. 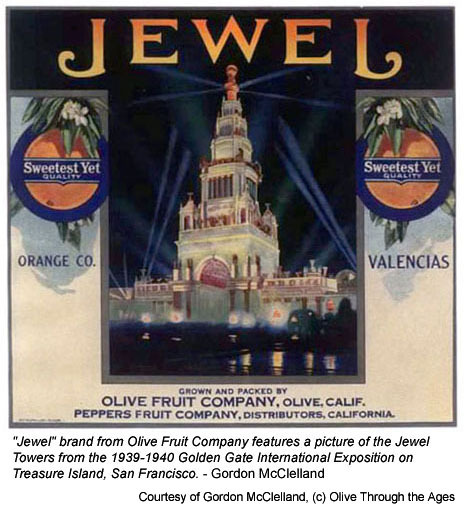 "Jewel" brand from Olive Fruit Company features a picture of the Jewel Towers from the 1939-1940 Golden Gate International Exposition on Treasure Island, San Francisco. 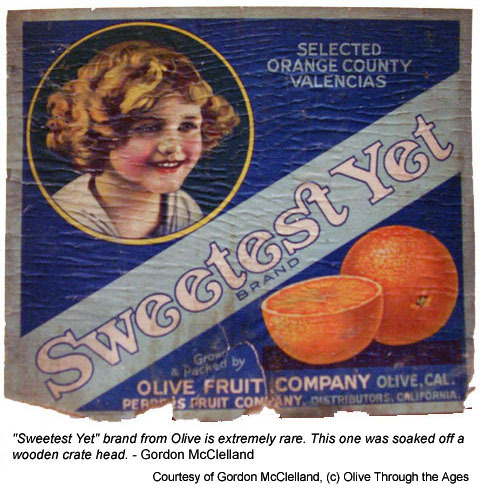 "Sweetest Yet" brand from Olive is extremely rare. This one was soaked off a wooden crate head. 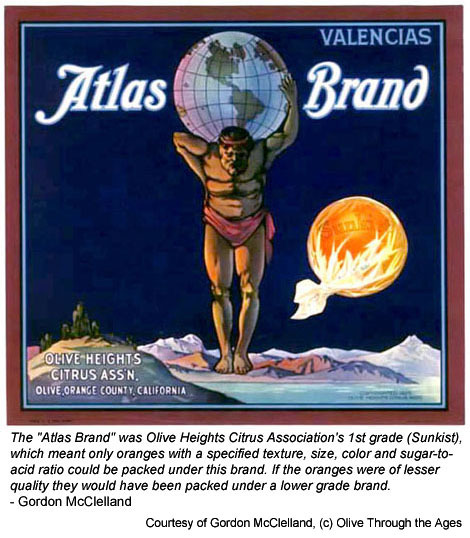 The "Atlas Brand" was Olive Heights Citrus Association's 1st grade (Sunkist). color and sugar-to-acid ratio could be packed under this brand. 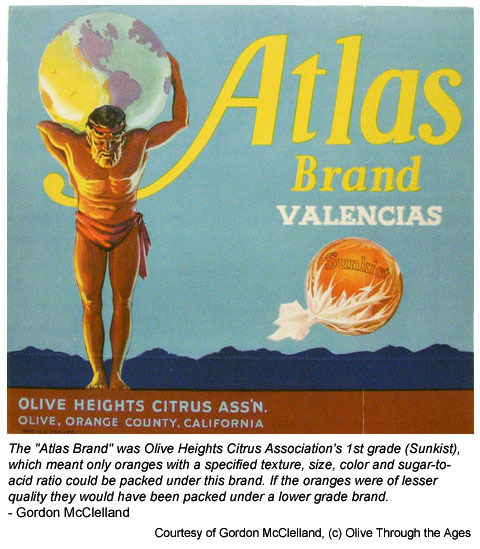 If the oranges were of lesser quality they would have been packed under a lower grade brand. 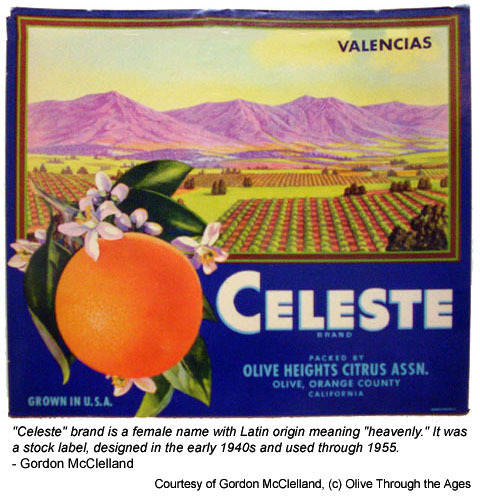 "Celeste" brand is a female name with Latin origin meaning "heavenly." It was a stock label, designed in the early 1940s and used through 1955. 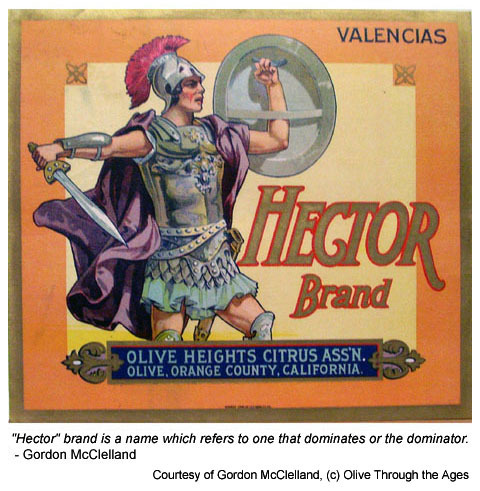 "Hector" brand is a name which refers to one that dominates or the dominator. 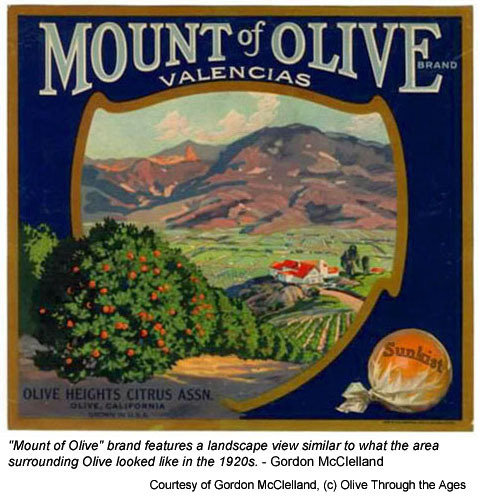 "Mount of Olive" brand features a landscape view similar to what the area surrounding Olive looked like in the 1920s. 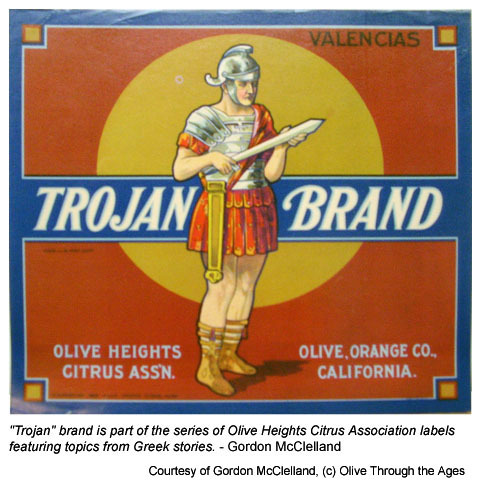 "Trojan" brand is part of the series of Olive Heights Citrus Association labels featuring topics from Greek stories. 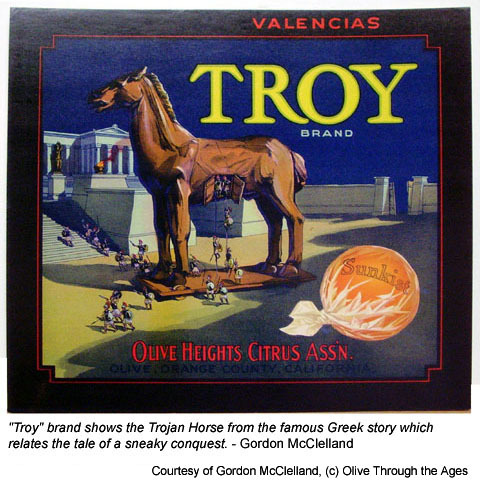 "Troy" brand shows the Trojan Horse from the famous Greek story which relates the tale of a sneaky conquest. 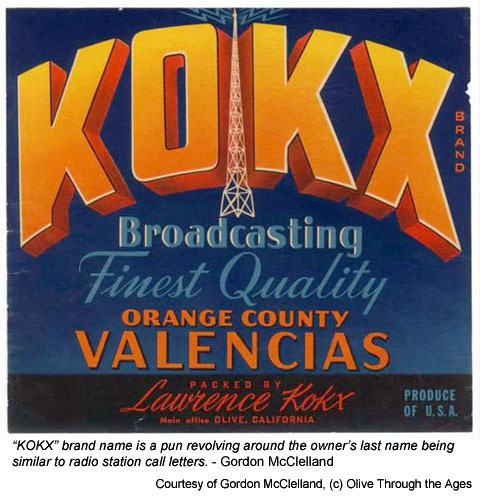 "KOKX" brand name is a pun revolving around the owner's last name being similar to radio station call letters. Copyright © 2005 - Daralee's Web World. All rights reserved.